Early days of the Grotto. 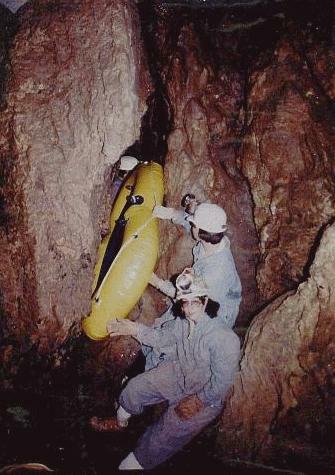 Before we'd learned to walk through caves on our own, we used various prosthetic devices. Here, Ken, Tammy and Barbara carried an inflatable raft with them in case they had to cross any puddles (water-proof boots hadn't been invented yet...).